Couldn’t He Have Thought of Something More Original? Oh, wait. According to Random House, they were orginal when he said them. But you knew that. “Hear hear!” –and he didn’t write this one first. 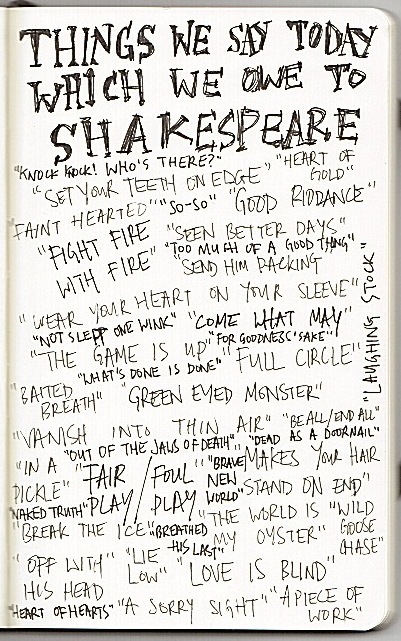 I’m a huge Shakespeare fan and it saddens me to know that fewer and fewer of our young people are exposed to his work. What’s worse is that phrases from his time that have lasted until our present are completely misunderstood today — “dead as a doornail,” for example. This could be made into a very nice wall poster. Only one nit to pick: check Merchant of Venice for “bate” (“abate”), not “bait” as in what’s used to lure prey.